London’s sub-surface lines, at least in part of the central and western zones, are facing some changes quite soon. 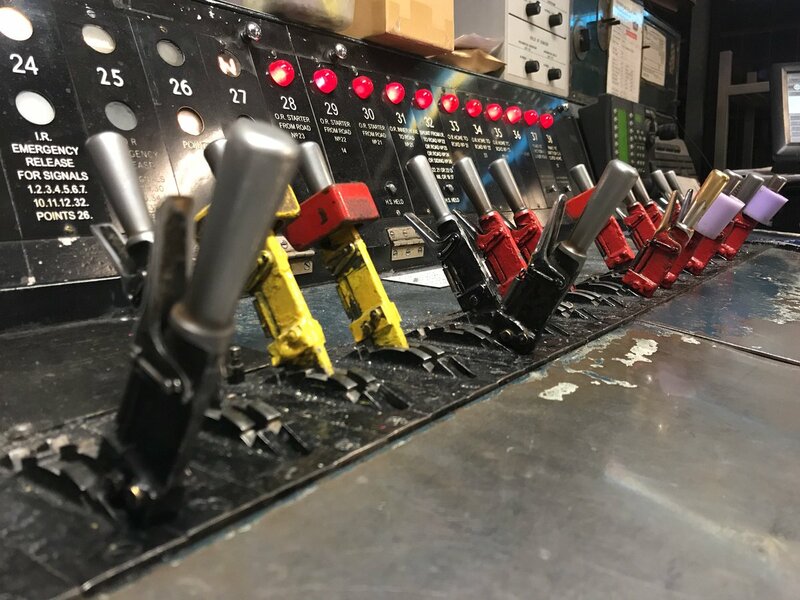 These will occur during the course of the next few months and will consist of an ‘enhanced system’ between Hammersmith/Finchley Road and Euston Square stations. TfL says customers will benefit from a far more reliable service on the three underground lines between these locations. That comes from today’s announcement by TfL of the changes to be made during the coming summer. Clearly the Four Lines modernisation will aim to reduce some of these delays and improve the passenger experience. This is a brief overview to discuss some of the pending improvements that will be made. For the past couple of months new signal equipment (wrapped in black plastic) has been up at several stations along the route, including Edgware Road (Met) where these can be seen immediately adjacent to the staircases onto the platforms. I have photographs of these from several months back when they were not even covered in plastic sheeting! The new equipment will be managed from Hammersmith Signal Control Centre (SCC) – see main picture. Current plans are for ATO to be introduced between Hammersmith and Latimer Road quite soon. The SCC will take over from Baker Street this month and it means Edgware Road’s 1920s signal box will be retired. Update 20th March: Although the SCC was to begin work this month, it is now being said its been deferred to 5th May 2018. Baker Street control will continue until that date. The delay in turn means the ATO between there and Latimer Road, due to begin in April, has been pushed back until 27th May 2018. Consequently the second stage ATO (Latimer Road-Paddington) is also due to begin on the 27th. There will be a full test weekend of timetabled working ATO 31 March-1 April 2018 which means the Hammersmith Lines and Edgware Road-HSK will be closed. The next stages of ATO will reach Paddington, then Euston Square later this year. It’ll be Aldgate/Monument/Stepney Green by 2019 and the rest of the southern Circle in 2020. The District Line from Aldgate to Becontree then Upminster in 2021 plus Met to Wembley Park. The Met onwards to Moor Park plus the District from Cromwell Road westwards during 2021/22 and the rest of the Met later in 2022. In terms of the underground’s coffee pot signals, it seems those at Barbican/Liverpool Street have another year or two before they’re retired. Those at Baker Street, Great Portland Street, Euston Square, have less than a year left. The new sidings at Farringdon are due to be built this year and these will entail additional work to the new ATO system before it can be fully implemented between Euston Square and Aldgate. The ATO consists of wi-fi masts set at very regular intervals. These send instructions to the trains whilst track detectors will record the location of trains. The wi-fi is complete as far as Paddington and these are usually on tall masts placed in the middle of the track formation througout the open sections. Where curves are traversed or the passage beneath the Great Western lines the masts are placed along the side of the tracks as the above pictures show. In the underground sections the ATO masts are anchored on the tunnel arches except where there are curves and they are then placed on the tunnel sides. The Metropolitan is due to receive the new equipment between Finchley Road and Baker Street and that too means monthly closures to 12 August 2018 on top of the Met’s ongoing week nights closures. Over the past year or so the train indicator system has been improved between Edgware Road and Hammersmith however there are still inconsistencies. Sometimes the system doesn’t even know what the trains are! ‘Check front of destination’ comes up often especially at the stations west of (and including) Paddington. Perhaps the displays show none especially when one is due. Additionally Hammersmith trains can be shown at all stations or at intermittent stations. It seems the system is still quite temperamental and clearly needs a lot of tweaking to get it right. The existing train indicators will continue to be used under the new system. It means the red indicators at Edgware Road will stay! I am aware quite a few people dont like these but they are there for a reason. This is going back nearly 30 years however I’m one of those responsible for having these particular indicators installed and there were a number of reasons why we chose Edgware Road station for this type of indicator. I may write about that another time.